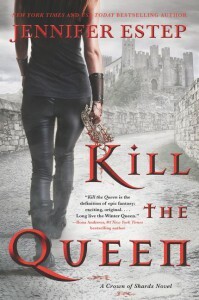 Review: Kill The Queen is Amazing! I enjoyed reading about Lady Everleighs experience at Seven Spire Palace and her growth as a character with Serilda Swanson's troupe of Gladiators. It was quite formidable how much she changed, and I couldn't put the book down. She loved people in general and fought hard to save her country because she was the Winter Queen. Her friendship with Paloma had me in tears. It was so kind and genuine. She learned how to fight from always getting knocked down and beaten, to winning death matches, gladiator fashion, with a sword dagger and shield in an arena! You go, girl! The tasks she thought were useless while living in the Palace of Seven Spire, proved to be critical and useful for saving her life. Baking and dancing. She was a Bellonan; good at playing the long game and outsmarting the opponent. Crown Princess Vasilia is the daughter of Cordelia the Queen of Seven Spire and Bellona. Vasilia is a powerful Magier with a black heart. When her mother Cordelia invites noble guests from Andvardia to negotiate peace, Vasilia massacres the lot of them and kills her mother and injures Everleigh. Everleigh has magic but keeps it a secret. She is immune to magic and can smell it a mile away. Everleigh gets thrown out of the palace when blasted by Vasilia's lightning and falls into the river below.